For many Americans, capitalism is a dynamic engine of prosperity that rewards the bold, the daring, and the hardworking. But to many outside the United States, capitalism seems like an initiative that serves only to concentrate power and wealth in the hands of a few hereditary oligarchies. As A History of Corporate Governance around the World shows, neither conception is wrong. In this volume, some of the brightest minds in the field of economics present new empirical research that suggests that each side of the debate has something to offer the other. Free enterprise and well-developed financial systems are proven to produce growth in those countries that have them. But research also suggests that in some other capitalist countries, arrangements truly do concentrate corporate ownership in the hands of a few wealthy families. 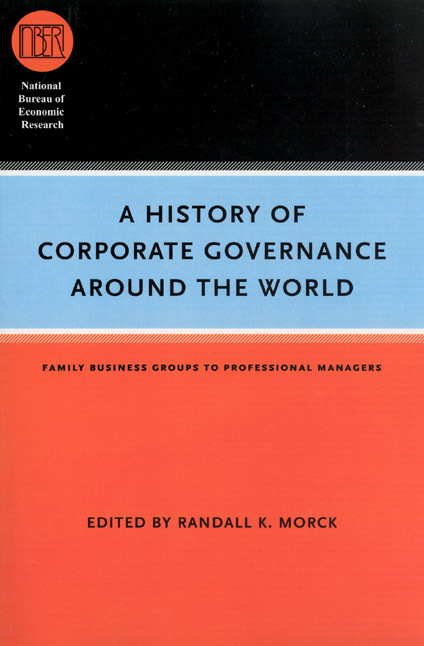 A History of Corporate Governance around the World provides historical studies of the patterns of corporate governance in several countries-including the large industrial economies of Canada, France, Germany, Italy, Japan, the United Kingdom, and the United States; larger developing economies like China and India; and alternative models like those of the Netherlands and Sweden. 11. Why Has There Been So Little Block Holding in America?